Welcome to Philosophical Quest! I am K.D. Borcoman. 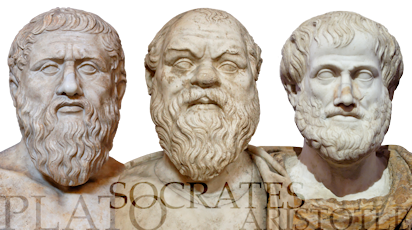 As the famous philosopher Socrates once said: "The unexamined life is not worth living!" What does it mean to be a human being with a life "worth living? "- with the capacity to think about, discover, and ponder the "truth?" What other creature on Earth resembles a human person in terms of his or her ability to engage in art, politics, science, architecture or poetry? Where and how do we fit into Nature or even into the Universe? These and many other questions have been asked by philosophers probably since it became possible to express curiosity and exhibit self-consciousness. What are the answers? Most important, how will the answers lead to a contented, satisfied and fulfilled life? How can a human being achieve happiness? 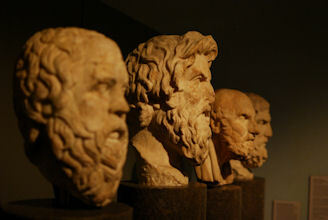 But, what is philosophy? Now Available! 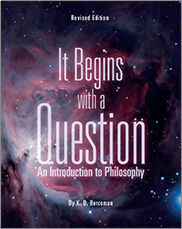 My revised texbook on introductory philosophy: It Begins With A Question! (ISBN: 978-1-62131-261-1) Order from Cognella or Amazon.com Check for the Blackboard Coursesites course designed to augment this text. for those who wish to participate for personal enrichment. I have been interested in philosophy as far back as when I first encountered the forests and lakes of my native Michigand.